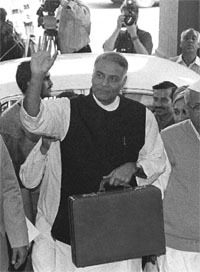 this year's budget had provided finance minister Yashwant Sinha with an opportunity to introduce green taxes. Instead, the government has shed even the slightest pretence of greening the Indian economy or setting some sustainable limit for economic growth. Except for four lines that promised more funds for afforestation, ecotourism programmes and the improvement of coastal mangroves in his speech, Sinha had nothing in terms of hard fiscal decisions to push for sustainable growth. In terms of green fiscal measures all that we get from the budget is a reduction in subsidy on urea. But to compensate for the lack of fiscal policies in the environment sector, the government has increased the total plan outlay from Rs 718 crore to Rs 965 crore. For prevention and control of pollution, the government has allocated Rs 300 crore - up from Rs 243 crore last year. Of this, the cleaning of the Ganga will take up Rs 210 crore. While the cosmetic changes include increasing the outlay for traditional systems of medicines, there is no effort to mitigate the growing pollution from motorisation and industrialisation to reduce serious health risks to the public. The government has demonstrated its level of commitment to the environment by reducing excise duty on diesel engines less that 10 horsepower. This is bound to encourage the proliferation of diesel three-wheelers which spew toxic emissions and increase health risks. A department of drinking water supply has been set up under the ministry of rural development to intensify the efforts and acclerate the pace of work. It is proposed to provide drinking water facilities in all rural areas in the next five years. The government has taken some steps to strengthen the rural economy. Credit flow to agriculture through institutional channels of commercial banks, cooperative banks and regional rural banks is estimated at about Rs 41,800 crore this year. It is expected to increase by over 20 per cent to a level of Rs 51,500 crore in 2000-2001. In the last budget there was a wide array of initiatives to promote the flow of rural credit. In this budget it was proposed to strengthen the earlier programmes and launch further initiatives. Under the existing provisions of the Income Tax Act, a five-year tax holiday and a 30 per cent deduction in the subsequent five years is allowed to a company or consortium of companies, operating and maintaining infrastructure facilities. These could include roads, highways, bridges, airports, ports, rail system or any other public facility of a similar nature. Water supply projects, irrigation projects, sanitation and sewerage systems form a part of infrastructure facilities under these provisions. The country needs large investments in the field of urban infrastructure, including public health. In order to attract commercial enterprises to operate such facilities, the budget proposes to extend the benefit of tax holiday to other infrastructure facilities like water treatment and solid waste management. "Governments all round the world are realising the need for fiscal mechanisms to control market forces. It is possible to increase revenue through green taxes to meet the pollution abatement costs. But in India these issues are treated with total disregard," says Anumita Roychowdhury, coordinator of the Delhi-based ngo Centre for Science and Environment's Right to Clean Air campaign. India has attained a measure of prosperity at a terrible cost. While India's gdp has grown 2.5 times between 1975 and 1995, the industrial pollution load has risen four times and vehicular pollution eight times. But policymakers have ignored the cost of death and disease due to an environmentally unsound development path.